I wasn’t planning on making dinner tonight, but the fire got lit, and I went for it! 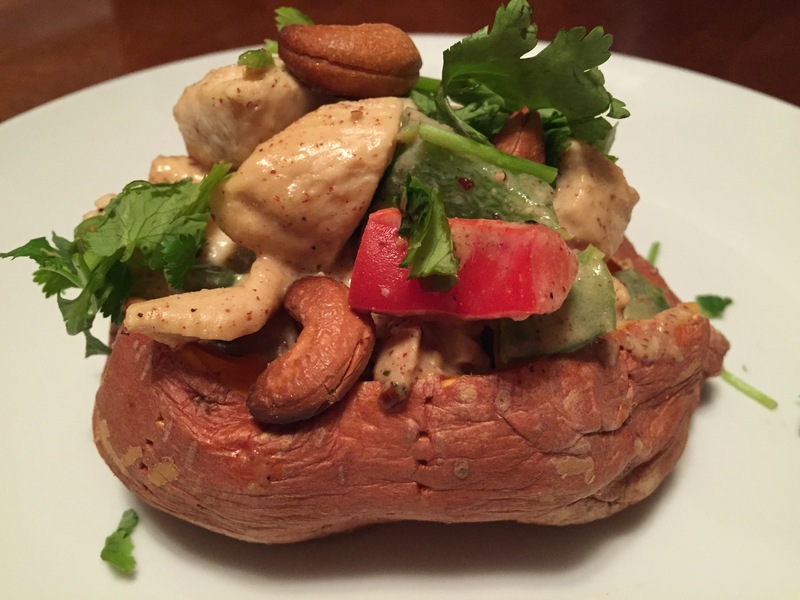 I had some chicken that needed cooking and some sweet potatoes that needed baking, so I googled, and BOOM – of course I find an insane amazing recipe on PaleOMG. I made a couple of adjustments to her original, so make sure to check out hers. I have to say that mine was pretty darn tasty too! Poke a few holes in your sweet potatoes and place in the microwave. Microwave one side 4-6 minutes depending on how big the potato is. Place a small amount of oil in a large sauté pan over medium heat. Add chopped chicken, peppers and sprinkle with garlic powder and a bit of salt and pepper. Sauté for about 7 minutes then add green onions and the sauce and mix well with the chicken making sure the chicken is cooked all the way through. While your chicken is cooking, place a handful of cashews on a cookie sheet at 400 degrees for a few minutes – pay attention so they don’t burn! Cut all 3 sweet potatoes down the middle, fill with the chicken mixture, top with cilantro and cashews. ← Made With Love… Valentine’s Day Treats!